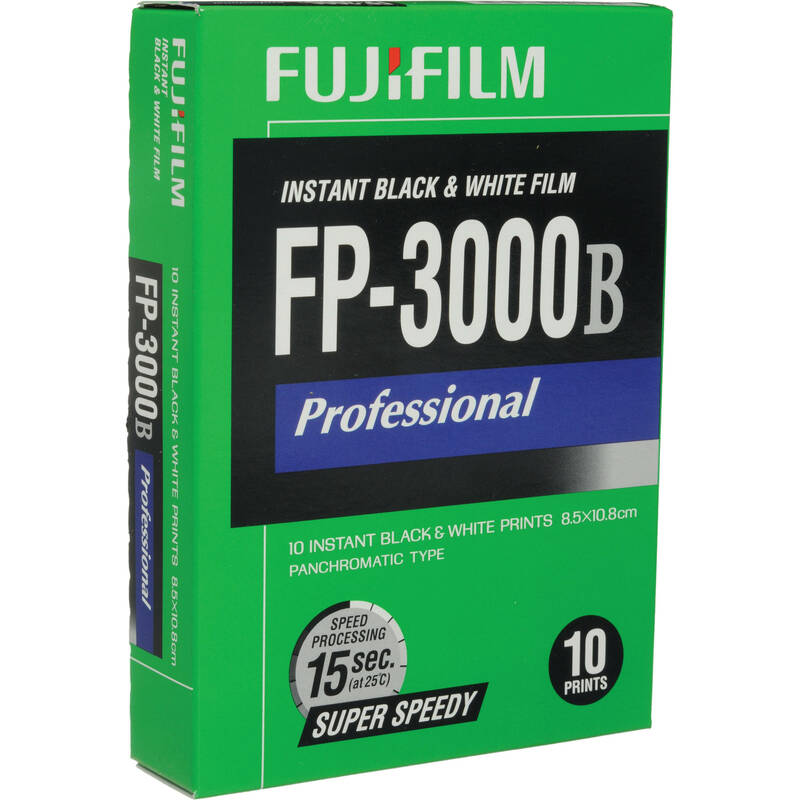 This is a 10 sheet box of FP-3000B Professional Instant Black & White Film from Fujifilm. It is a high-quality, fine grained, sharp, instant black-and-white film. Its ISO rating of 3000 makes it perfect for low-light scenarios. This film is suitable for industrial, scientific, ID photography, portraiture and general photographic pursuits. This box of film has an expiration date of 09/2014. Box Dimensions (LxWxH) 5.6 x 4.0 x 1.1"
FP-3000B Professional Instant Black & White Film (10 Exposures, Expired) is rated 4.8 out of 5 by 156. Rated 5 out of 5 by Jono from Have bought heaps of these already! Lovely black and white images with a decent latitude. You can't expect anything more! I have not tried 100B however, but 3000B can be stopped down with the ND filter to shoot in daylight. But why would you want that, 3000B at night time is where it truly shines. Images are developed within 60 seconds or less depending on weather. The goop/chemical is a little strong smelling and may give you a little headache. Many user's enjoy saving the negatives and scanning them, however I have not had any good luck with getting a decent scan with them. All in all, an excellent product from Fujifilm that I hope they don't discontinue. Rated 5 out of 5 by alienmeatsack from Beautiful film - sadly discontinued I can't say enough wonderful things about this pack film from Fujifilm. It develops in literally 30 seconds or less, makes crisp gorgeous photos, is nearly impossible to ruin since it's chemicals stop developing on their own and it's contrast is wonderful. The very high ISO made it great for snapping photos in medium light since not much light was required to make an image. Sadly, very recently Fujifilm discontinued this film. So grab it while you can. There are no more black and white pack films made anymore and this wonderful classic film is destined to slowly vanish as the supplies dwindle. Rated 5 out of 5 by Zory from Great film, great fun! This is the only remaining black and white type 100 film that is readily available and I sincerely hope that it never goes away. I use it in my polaroid 360, 250, 100, and a polaroid back for my Hasselblad. Tis film is a bit contrasty, but it more than makes up for that contrasty-ness in it's ease of use. It develops in only 15 seconds, which is great! Plus the high iso means that my polaroid cameras default to smaller apertures, which means that the depth of field is great and i get more sharp shots. If you are new to peel apart instant film, thus is the place to start. Rated 5 out of 5 by Justin from somebody save this stuff Hopefully somebody will take up the mantle of producing type 100 instant film since Fuji is giving up on it. 3000b is a rich and responsive film. The photos have beautiful contrast. The instant b&w print is such a classic staple of photography, and like any great classic artistic medium, it will always be good and there will always be artists who want to produce art with it. People still paint with oils, people still make music with acoustic instruments, and plenty of photographers still shoot on film. Rated 4 out of 5 by Roger in Vancouver from ISO 3000 whoa. I use the FP film exclusively on my Hasselblad 500c/m. The exposures from the FP-3000B are very nice and contrasty. The only real complaint I have against the film is the paper negatives they produce. They are extremely delicate and prone to picking up all sort of contaminants even when dry. Although the look is quite interesting, I wish they produced negatives like the FP-100C Professional film. Rated 5 out of 5 by Joo de Medeiros from Amazing Black&White Film It's a shame this film is out of production. The tones and contrast were unique, and the depth you could get was amazing. I can highly recommend this product for anyone you enjoys powerful B&W photos with deep and rich black. The bonus was it's speed, ISO 3000. Rated 5 out of 5 by Shlee from Photographer shmonogapher when I was in high school my first boyfriend bought me a Polaroid land camera. Not until a close friend of mine opened up a film studio three years ago did I know they still made film for it. For ten dollars you get ten shots and each shot is worth 100 times more! If you can find a landcamera in good condition this film does the rest. In no way would I consider myself a photographer but I have always considered myself handy with a camera. I can't tell you how perfectly this professional film catches light and the depth of every picture. Sometimes I feel like this film is magic because there is no way I am capable of capturing some of the moments that I have. So... In conclusion, buy this film! Quick! Before they stop making this one too. Rated 4 out of 5 by Trey from When it works, it's amazing. This is expired film, so I guess I should be happy with whatever I get. That being said, I managed to tear the dark slide when I loaded the film and had to open the back of my Polaroid 100 to get ahold of it again. I guess that's what exposed the first two photos in the pack. They were basically totally black. The first one had some fuzzy white blurs, but that's it. The second was totally black. The rest of the photos I've taken (still not done with the pack) were amazing. Such beautiful contrast. I'm sad that Fuji doesn't make this anymore. Thanks for answering my earlier question.However, since this film is no longer made and I think the last expiry date for this film is 2/15, please let me know the date of your film. I understand that you consider an expiry date of less than 6 months as short-dated, so does this mean the expiry date of your film is later than 2/15?Thanks. The last expiry date we have available for this film is 06/15. Is this film compatible with a Fujifilm PA-45 Film Holder for 4x5 Instant Peel-Apart Pack Film? does not matter to fill the frame, but at all the mechanichal issues ? The info in your web page says Fuji Instant Holder PA-145 .... but how about the pA-45? Unfortunately, this film is not compatible with the Fuji PA-45 holder. Please tell me the expiry date of this film.Thanks. Is this film compatible with the Polaroid 405 Instant Pack Film Holder? Unfortunately, the Fujifilm FP-3000B film will not be compatible with the Polaroid 405 Instant Pack Film Holder. Is this product compatible with the Forscher npc back for the Nikon F3 camera? 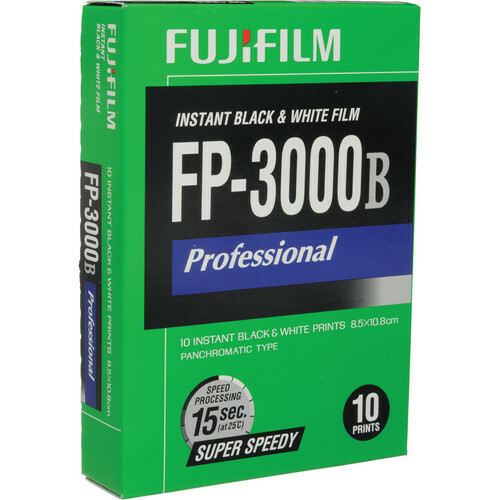 Yes, the Fujifilm FP-3000B Professional Instant Black and White Film is compatible with the Forscher NPC Back for the Nikon F3, as this film is the correct 3 1/4 x 4 1/4 size. This film will also work with any other back that takes this format of instant film. will this film work in the old polaroid automatic 14 land camera? Yes, the Fujifilm FP-3000B film will work with Polaroid Automatic Land Cameras. What is the dating of this film? I have a polaroid film back E for my Bronica ETRSi. Will this Fujifilm instant B&amp;W film fit in my Polaroid back? Yes, the FP-3000 is a standard 3.25 x 4.25 format and will fit your holder, but your image size will onlybe 2.25 x 2.25 as the square opening of your Bronica!